There are several types of tiles used for residential and commercial applications. Tiling provides one of the most cost-effective and environmentally friendly flooring choices. Tiles are made from natural clay and often other (recycled) materials. Tile manufacture does not necessitate the use of heavy chemicals or other harmful substances, unlike other flooring types. There are no trees to be cut down as with hardwood floors, and the best part is that tiles are durable and have a long lifespan. 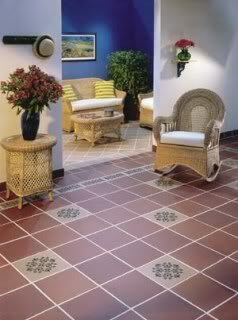 Ceramic tile is the most common tiling used in the US in offices, stores and homes. Ceramic tile comes in two forms: glazed and unglazed. Unglazed tile (see below) is referred to as quarry tile. Ceramic tiles are made from clay and then heated. The glaze, which creates the color of the tile, is added after firing. The glazing process allows for the creation of infinite color combinations. Learn more about the benefits of ceramic tile. Quarry tile is unglazed ceramic tile. Inexpensive, durable and natural, quarry tile is also less prone to chips and scratches. The color selection is not as vast as with other tile types, but there are several shades of red, orange, brown, gray and more. In residential applications, quarry is used for kitchens and pathways because it has a naturally coarse surface, making it less slippery than some other surfaces when wet. Use freeze-resistant grades for outdoor tiling to prevent any weather-related problems in colder climates. 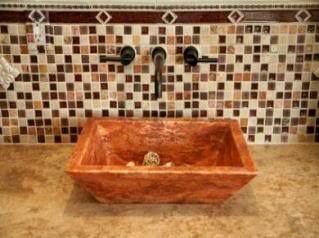 Like almost all types of tile, quarry is porous, which means that it can become stained. Those who choose to install quarry in a kitchen generally apply a glaze-like seal or wax finish to help prevent stains and other damage. Clean unglazed or unsealed quarry with only a small amount of water. Too much moisture can damage the tile and lead to mold growth in the grout. porcelain is made from finer-grained clay than ceramic. porcelain is fired at a higher temperature. These factors make porcelain tile denser, less porous, and more resistant to moisture and stains. As a result, most porcelain tiles are suitable for both indoor and outdoor installations. Porcelain tiles are hard to cut due to their density and hardness, so the cost and labor involved is often higher. In recent years, though, prices have become closer to those of ceramic tile. Porcelain tiles are available in matte, unglazed or high-polished finishes. Tile mosaics allow you to be creative with your tile design. Mosaics are most commonly used for smaller areas, such as a bathroom or kitchen backsplash, or even small counter space areas. Mosaic tiles are usually less than six inches square and made of porcelain or clay composition. Many come in squares, octagons, hexagons or other unique shapes. The tiles are also available in premounted paper or fabric mesh sheets to simplify DIY tile installation. Granite – Granite has long been popular as a handsome kitchen countertop material, and it is also made into floors, shower walls and bathroom counters. Granite tiles are naturally antibacterial and aren’t damaged by water contact, making them a great choice for kitchen and bathroom applications. Slate – Slate tiles are growing in popularity due to their versatility. They are used outdoors as well as inside the home and are even utilized as roofing shingles. Slate tile is available in several color ranges, from gray to purple to black. Travertine – Travertine is a type of limestone. 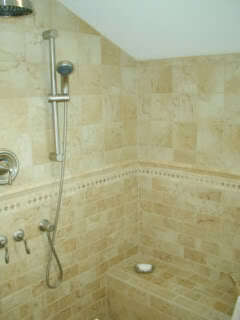 Beige travertine tiles are used for bathroom floors, kitchen backsplashes, shower mosaics, and more. Although travertine tiles are soft and require several coats of sealant, homeowners appreciate their relatively low cost compared to other natural stone. Marble – Marble tiles have been used for centuries in homes to create a luxurious, unique look. There are variations in the color of each tile, creating a one-of-a-kind design which many homeowners prize, while others prefer a more consistent look, like ceramic tile. Marble tiles are porous and must be sealed. Onyx – Onyx is well known for its creamy, pearl-like look and striking colors. Costly and somewhat fragile, onyx tiles are not a common choice for flooring, but they can make a beautiful, bold design statement. Sandstone – Sandstone, which is extremely durable, has a grainy look and feel. 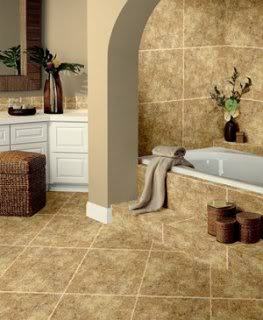 Sandstone tiles range in color from yellow to pink and red, and are great for kitchen flooring. Find a professional tile installer to help you decide the best types of tiles for your flooring project. This article was updated November 30, 2017.